Net Working capital, in very simple terms, is basically the amount of fund which a business needed to run its operations on a daily basis. In other words, it is the measure of liquidity of business and its ability to meet short term expenses. 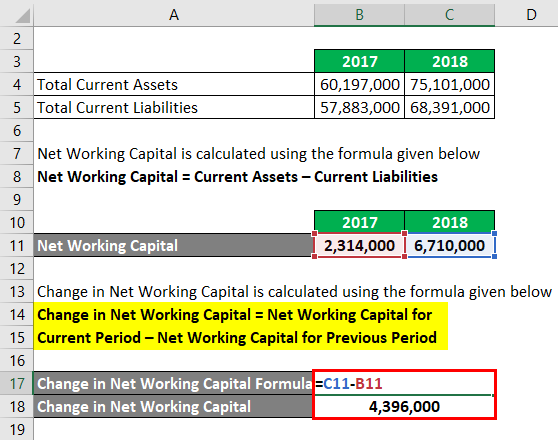 Change in Net Working Capital is calculated as a difference between Current Assets and Current Liabilities. So higher the current assets or lower the current liabilities, higher will be the net working capital. 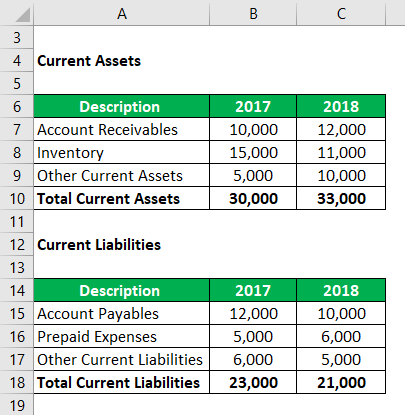 Determine Current Assets from the company’s balance sheet for the current and previous period. Current assets include Inventory, Receivables, prepaid expenses, etc. Determine Current Liabilities from the company’s balance sheet for the current and previous period. Current liabilities include accrued expenses, payables, deferred revenue, etc. 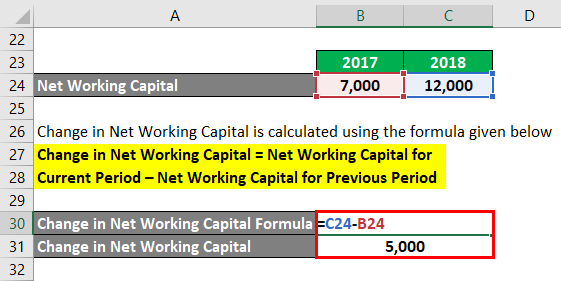 Calculate the change in net working capital by taking a difference of the calculated working capitals. 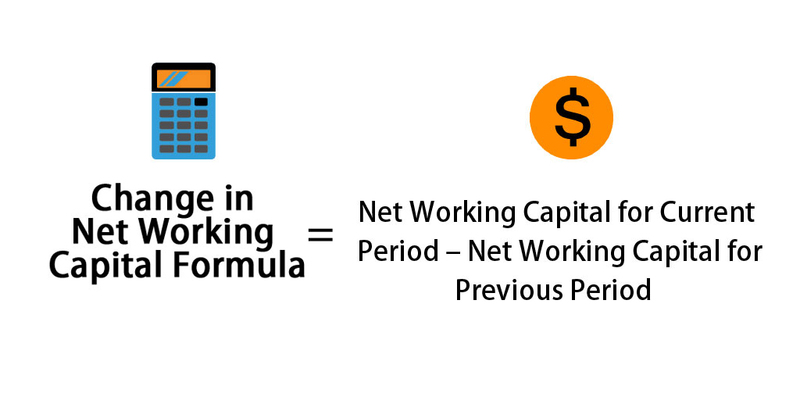 Let’s take an example to understand the calculation of Change in Net Working Capital formula in a better manner. 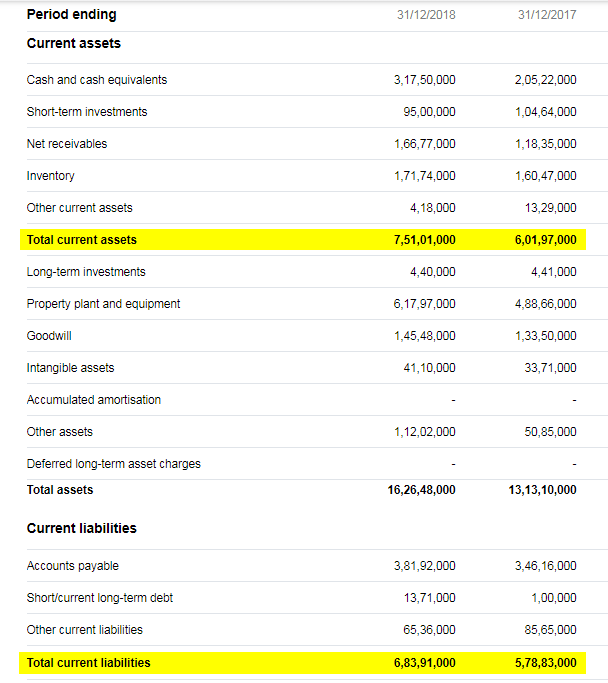 Let say company A has the following values of current assets and current liabilities for the year 2017 and 2018. Calculate its Change in Net Working Capital. Since the change in net working capital has increased, it means that change in current assets is more than a change in current liabilities. So current assets have increased. It means that the company has spent money to purchase those assets. So this increase is basically cash outflow for the company. 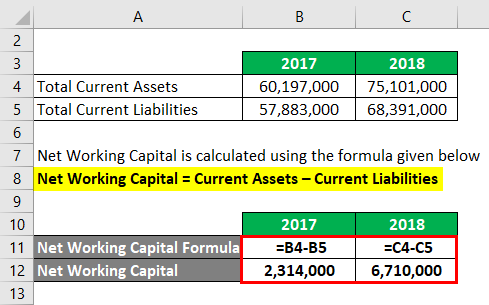 Let take an example of Amazon and calculate its Change in Net Working Capital. Working capital is a very important concept and it helps us to understand the company’s current position. When a company has more current assets than current liabilities, means that positive working capital, it implies that it can easily cover its short term expenses. So positive working capital symbolizes good financial strength. But bear in mind that constant excessive working capital can lead to the inference that the company is not managing its assets efficiently. On the same line, Negative working capital does not mean that it is bad. It can be the case that the company has purchased something to expand its business. But if it is negative for a long time, it can imply that a company is in a difficult position. Similarly, change in net working capital helps us to understand the cash flow position of the company. So if the change in net working capital is positive, it means that the company has purchased more current assets in the current period and that purchase is basically outflow of the cash. So a positive change in net working capital is cash outflow. Similarly, negative change in net working capital means that current liabilities has increased in this period. So this can be in the form of increased payables etc. which means that we have cash inflow. So negative change in the working capital is cash inflow. Working capital is part of a company’s daily operations and they need to monitor it on a regular basis. Net Working capital is very important because it is a good indicator regarding how efficiently a business operation is and solvent the business is in short-run. If a company is not able to meet its short term liabilities with current assets, they will not have any other option but to use noncurrent assets and because of which it will lead to operational and financial problems. Similarly change in net working capital, as discussed above, is also a very critical component in determining the cash position of the business. Companies need cash to operate and if they do not have a sufficient amount of cash balances, they might have to face a difficult time. 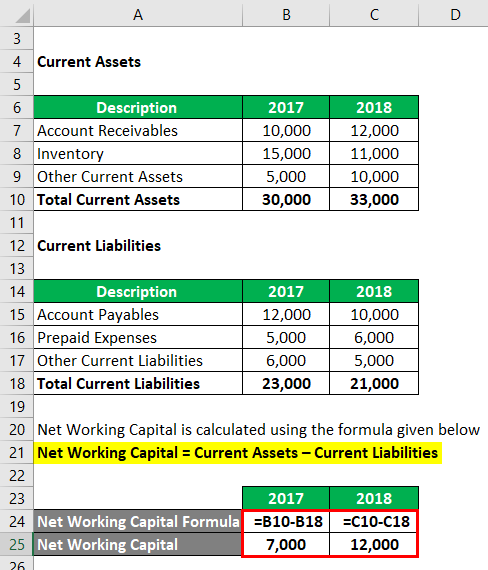 Drastic positive change in net working capital means that cash balance is reducing very rapidly and if unprecedented circumstances arrived, companies have to sell their fixed assets to pay off. In nutshell, business managers should keep a close eye on the change of working capital and raise a flag if it is going out of control.